In late spring and early summer (or really, most of summer), I often find myself wearing a light jacket with shorts as a nod to the vagaries of the weather. In spring, this has the obvious benefit of keeping you warm during the chilly morning and evening hours, and over the summer I find that a light jacket offers welcome relief from the sun – as long as I’m not moving around too much. I’ve mentioned the summer jacket in the recent past, but it’s worth repeating that the right cut and fabric can be very comfortable, even in the hotter months. Some of you may remember that I spoke briefly about San Francisco’s Evan Kinori, and his are just the type of jackets that are perfect for this purpose. Based on traditional chore jackets, but in a more interesting cut and more interesting fabric. Currently, the 3-pocket jacket is available in a hemp canvas, which sounds just about right for warmer temperatures. Feel free to roll the sleeves if you get too warm. 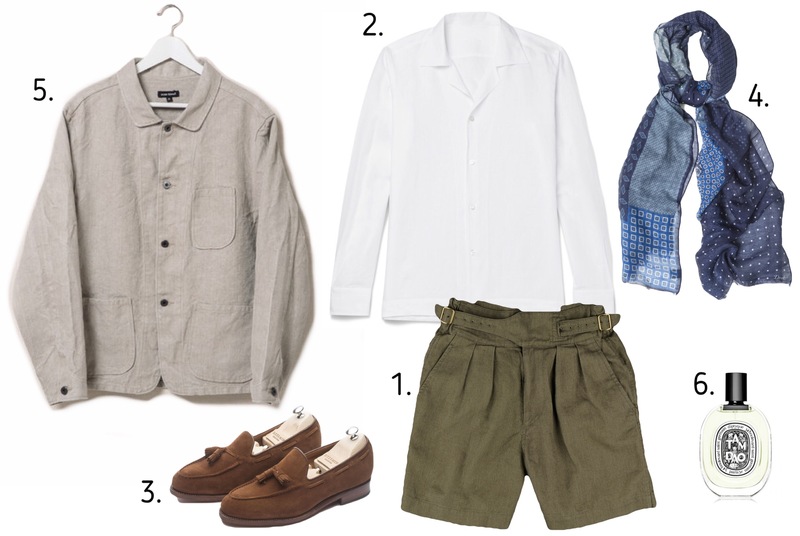 I also recently mentioned gurkha trousers in passing, and these shorts from Beams+ are kind of like the less intense version of the repro model of gurkha shorts (you can find them at What Price Glory), which should make them a bit easier to wear. I like greens and tans (and blues and browns, of course) for spring, when everything has a bit of that earthy, soily smell to it. You’ll want to layer, of course, and something like this linen camp-collar shirt is ideal for when the sun finally comes out, as well as a pleasantly charming alternative to your standard linen button down. Camp collars always make me think of vacations, since you’re obligated to wear them unbuttoned. Of course, if it’s cool in the morning you’ll want something to keep your neck warm, and these patchwork print scarves from Drake’s are really handsome and perfect for spring. Finally, Dyptique’s “Tam Dao” has got to be one of the easiest-wearing and most accessible “good scents” (those are heavy scare quotes) available, and frankly, it smells fantastic. It’s warm and woodsy without being overpowering, and doesn’t veer into Too Manly territory.